What does a bass see when they see a grub? A baitfish, crawfish, insect, something, anything, everything? Whatever they see it as, they see it as something to eat! Historically, these lures have been small, stubby, fat bodies with a "flappin", "twistin" curly tail. Sound like anybody you know, without the tail I mean? They were initially 3" in length. In the recent years they have become "fatter" and longer with a 3" or 4" being a favorite of mine and many other anglers, especially for smallmouth bass. For river fishing I use even shorter versions that are barely over 2". Many anglers use 5" single tail and Spider grubs the majority of time for largemouth bass. 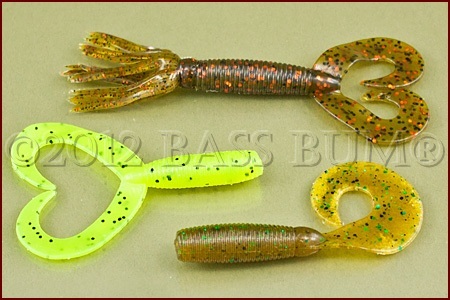 Once small, nondescript, single tail lures, the plastic grub has now evolved into twin tail versions, "spider" styles with "mop" type appendages on one or both ends and in lengths up to 10". While most often fished on a jighead, a plastic grub can be Texas-Rigged, used on a Carolina Rig, are great on a split-shot rig and can even be fished as a Drop-Shot bait. They're effective to differing degrees in every season because they can be fished both shallow and deep. They are well known as super smallmouth lures because they're so effective in clear water reservoirs lacking widespread cover but they're equally good for catching largemouth and spotted bass. 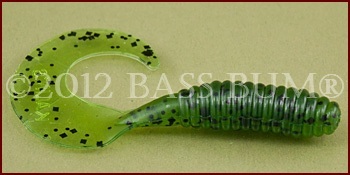 Though there are many grub designs there are two which are the best for bass. The most popular is the "curly-tail"and the "spider grub". Curly-tail grubs are the most popular style by far. These have curly, wavy single or twin tails. They flutter and undulate (there is that word again) creating "waves" on the retrieve. This water displacement enhances the visual action of a grub in clear water. Bass both see and feel the grub. In stained water, these waves "tweek" the lateral lines of bass the same as "noisier" crankbaits or spinnerbaits do. 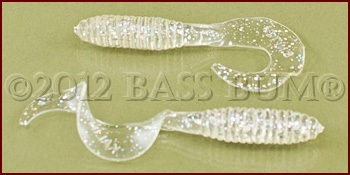 A single tail plastic grub is probably the best choice when you're trying to imitate baitfish. If it's crayfish then a twin-tail is better. The double tail versions coupled with a football jighead are also good for use in clear, rocky lakes with little grass or other vegetation. Spider grubs are usually 5" long, though you may find some a bit shorter. They have curly tails on one end but they also have a "mop" of flexible legs on the other. These legs allegedly cause bass to hold the bait a bit longer. I'm not sure about that but I do know they catch bass and are particularly deadly in the spring. Spider grubs certainly don't imitate baitfish. 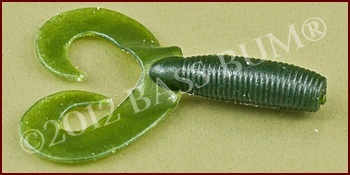 They resemble crawfish and can be very effective when worked across the bottom, especially in clear water. However, because they have so much movement from their tail and "mop top" tentacles they're good for stained, even muddy water. Spider's are good baits for flipping and pitching. They can be fished slow or fast across the bottom, either hopping or dragging, like a crawfish moves from place to place. Use Spider grubs on round or football jigheads or even Texas rig them. What is the most popular size plastic grub? A 3" is probably the most used size, especially among smallmouth fishermen. But longer sizes from 5"-9" are used for largemouth bass. You'll find more about size selection on the page where "grub fishing techniques" are discussed. I've discovered that purchasing a bag of grubs is "hit-or-miss" as to "actual" size despite what the package says or who the manufacturer may be. When you buy a package of grubs just because the package says the grubs inside are a certain length does not mean they will be that length. I suggest you examine the grubs inside through the clear packaging before making your purchase. There does not appear to be any "standard", or for that matter accurate, measure among manufacturers. Probably the most used rigging method for a plastic grub is to place it on a jighead. Several different jighead styles are used. Should be the first choice if you are fishing in a reservoir where there is more rock than vegetative cover. The shape helps avoid snagging as it will "tilt" over and away from rocks. Are the most popular jig type and especially a good choice if you are not fishing a rock strewn bottom. Why? Because round heads jigs have a greater tendency to get wedged among rocks. Nevertheless, they're good for swimming a jig or hopping one across other bottom surfaces. Talk to a group of bass fishermen who fish grubs and you quickly learn there is no "absolute" when it comes to jighead weight. Every "bass bum" will have a weight and shape they feel is the best. It may be the "best" in their hands but it might not be in yours. Find through experimentation which size and shape jighead works for you. Don't overpower your grubs by using jigheads too heavy for their size and the depth you are fishing. There are some "general" guidelines below. Most situations are covered by 1/8, 1/4 and 3/8oz jigs. In water less than 15' use 1/4oz on 4-5" grubs. With 3" grubs use a 1/8oz or 1/16oz. If fishing deeper than 15' or in river current use a 3/8oz or larger depending on water depth. Tail Rigged Up Or Down? Me, I rig a plastic grub with its tail up, though some will argue that this can interfere with hook-sets. I've not found that to be a problem. The more important consideration is to insure that your hook point comes through the mold seam of the bait in line with the tail. How you plan on fishing your plastic grub and which forage you are attempting to imitate will decide the color you choose. A color that is low-vis and blends with the surroundings are sometimes the best choice. Why, because a grub is a non-descript shape that can be interpreted as most anything a bass eats, a baitfish, crawfish, tadpole, anything, nothing. Water color is affected by whether the sky is clear or cloudy. Natural colors, which match the color of the water and "blend" with the colors found in vegetation and rocks below the surface, are the key with few exceptions. Good choices are variations of greens, browns, white, smoke and black. Personally, I like any of these that have a bit of sparkle mixed in. 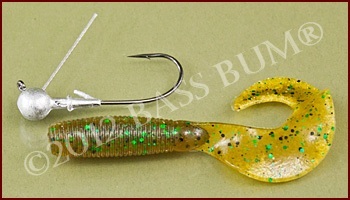 The clear grub above, which is Kalin's Holographic Lunker Grub, is a great jig color. It presents a subtle image reflecting and blending with the background colors of its surroundings. Thus camouflaged, as are the natural prey of bass, it will give off the same faint, illusive clues a bass is accustomed to seeing from its prey. Since most baitfish have white to cream colored bellies with shiny, reflective sides it's hard to go wrong with smoke color which includes some sparkle. White or clear with sparkle can be good producers too. Inexplicably, chartreuse is very effective for catching smallmouth bass. This color seems to really tick them off. Include it in your smallmouth arsenal. 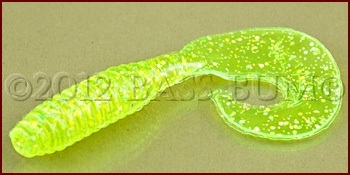 Don't overdo it with largemouth, but a little bit of chartreuse "accent" in a grub can prove effective with them as well. Imitating crawfish? Then go with greens and browns that have some orange, red or beige in the body and tail. Ball headed jigs with a guard like the "Bite-Me" jig shown at right, are good when using grubs around brush, submerged trees and vegetation.